In our daily life we do not much care about the past of our neighborhood. So far as we live in Tokyo, in particular in its western part, what we see are mostly from the recent few decades. However, if we have a mind to discover our past, it is not much difficult. The best way is to find out old highways which pass by our neighborhood and walk along them for a while. Then, we can find numerous heritages from the past. In Hamadayama area we find so-called a couple of "Kamakura-kaido" (Kamakura roads). They are narrow and winding roads originated in the medieval times. After Minamoto no Yoritomo (1147-1199) chose Kamakura as his seat of government at the end of the 12th century, Kamakura, which is located on the Pacific coast of Kanagawa Prefecture, was the center of power in Kanto region until Tokugawa shogunate shifted it to Edo - present Tokyo - at the beginning of the 17th century. Therefore, most of the old roads which were constructed before the Edo Period connected Kamakura with provinces and in case of our neighborhood they generally run from the south to the north as Hamadayama is located in the north of Kamakura. Concerning the roads constructed in the Edo Period, please check the article on "Seven windings at Ozaki". 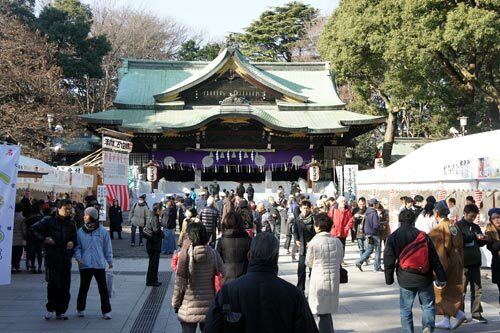 My starting point was Omiya Hachimangu. 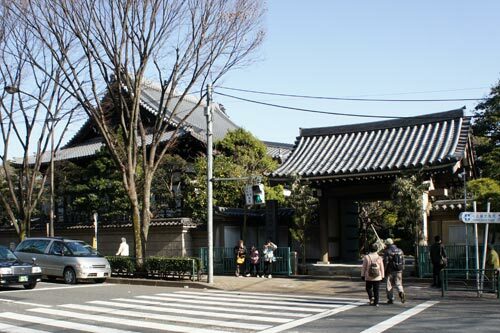 An old road, "Omiya Road" or "Shimousa Road", passes by the shrine in front of its eastern gate in the south-north direction. 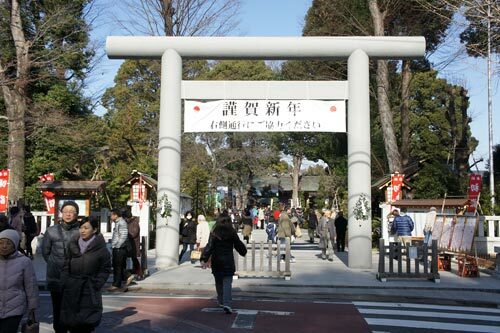 As I already mentioned in another article, Omiya Hachimangu was, according to the tradition of the shrine, established in 1063. Minamoto-no-Yoriyoshi (988-1075), head of Minamoto Clan, saw a white cloud stretching horizontally above the north bank of Zenpukuji-gawa River and associated it with the white banner of the clan. He thought this was a good omen and decided to build a shrine dedicated to Hachiman, god of worriers and especially worshiped by the Minamoto Clan. However, this area was believed to be a sacred place since much earlier time. Several square shaped tombs from the late Yayoi Period (ca. 1,000 BC to 300 AD) were excavated here, which indicates that the area was a sacred place for the residents of the settlement on the opposite bank of Zenpukuji River several hundred years before Minamoto-no-Yoriyoshi established Omiya Hachimangu. In fact the northern bank was used by generations of people. The Matsunoki ruins contain remains from the Jomon Period (ca.14, 000 BC-1,000 BC) till the Kofun Period (ca. late 3C – late 7C). 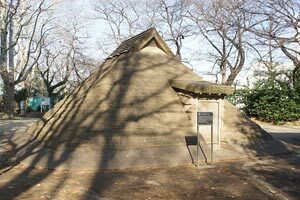 Now, a reconstructed house from the Kofun Period stands there and we are explained how our ancestors used to live here. Only a few minutes' walk from Matsunoki ruins, there was a small inari shrine on the western side of the road. There was no explanation about the history of this tiny shrine, but it was surrounded by tall trees and I guess that the shrine must be at least a few hundred years old. (*) Koshin is one of the 60 different days of a calendar cycle conceived in old China. A theory of Taoism says that three "worms" live in a human body and they go out of the body in the Koshin night, while their host person falls asleep, to report to the God of Heaven about his sins and crimes. Therefore, people must sit up all night long to prevent the worms from reporting bad news to the God. However, as it is not easy to sit up all night by oneself, Koshin circles were established during the Edo Period so that their members gathered together at certain place to hold out against drowsiness whole night long. Koshin-toh was erected as an evidence to have undertaken Koshin gatherings for 3 years and 18 times. Usually Shomen-kongoh, a deity of Buddhism, stands as main Buddha and wise monkeys are engraved because "shin" of Koshin means "monkey". I believe that Koshin gatherings were good entertainments for participants and it was natural that they rapidly became forgotten at the beginning of the 20th century when scientific thought and modern entertainments started to spread over the land. 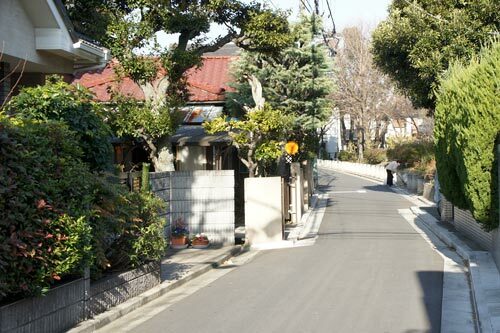 After crossing Itsukaichi-kaido, the road became narrower and passed through private houses. All houses were surrounded by greenery though their land was not large. It is often said that Tokyo and many other cities of Japan do not possess enough public greenery like many European and American cities. However, we have always small greenery in our own house and when houses become older, trees and bushes grow and we can see a peaceful cityscape full of greenery everywhere. 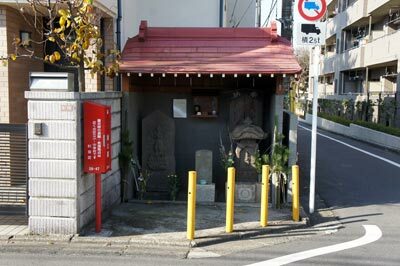 At a corner of such residential area, I discovered a stone statue of Jizo (Ksitigarbha). According to the explanation besides Jizo, it was built in 1737 by a group of mothers in the neighborhood called “Sekiguchi". They organized a group of Buddhist believers, saved a small portion of cereals from their daily consumption and after 5 or 6 years made this Jizo statue as a patron of children. At the time baby mortality rate was very high and this statue was an embodiment of the sorrow of mothers who had lost their children. 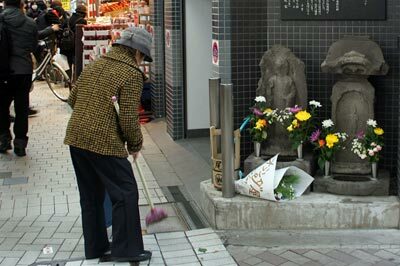 The statue were since then taken care of by mothers in the neighborhood and their activities were supported by a big landowner family Tsutsumi. Still now there is a group of neighbors centered on the Jizo statue. 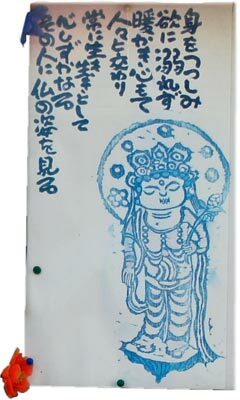 A paper on the nearby bulletin board of the group says; "Be prudent, don't be overwhelmed by greed, keep good company with warm heart, live always full of life and in peace, then people see in you a Buddha". Jizo and Koshin-toh at a crossroads of Pearl Center. An old lady is cleaning the environment. Koshin-toh and Jizo in "Pearl Center"
I walked farther north and crossed the now wide Oume-Kaido, then I reached a shopping street called "Suzuran dori". After hundred meters or so, the street got glass roof and changed its name to "Pearl Center". Shops started to open along the old road when Asagaya railway station opened in 1922. Pearl Center is now a lively shopping arcade and the road meanders through hundreds of shops. 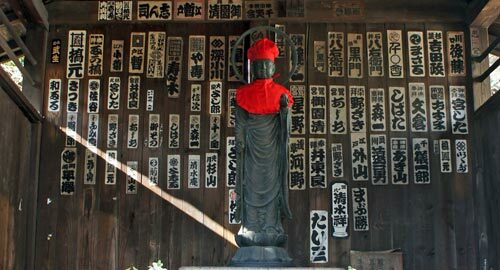 In the mid of the arcade there is a crossroads of two old roads and two stone statues stand: Koshin-toh and Jizo. Both were erected in 1691 and since then taken care of by neighbors. According to the explanation beside the statues, this part of the road used to be called "Gongen-michi", which indicates that the road was used by people who visited "Ne-no- Gongen" in the present Saitama Prefecture. Where Pearl Center reaches JR Asagaya Station, the road turns right sharply and again left. This part of the road is the approach to Asagaya Shinmei-guh which enshrines Amaterasu Oomikami. 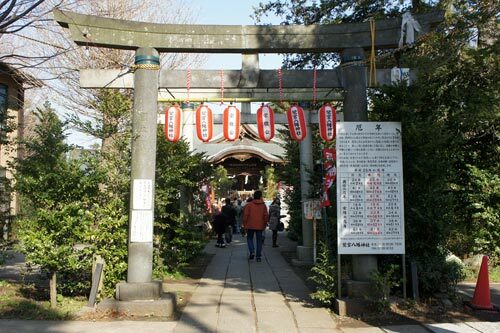 According to the tradition of the shrine, a legendary hero in the Japanese myth, Yamato-Takeru-no-Mikoto, took a rest at Asagaya on his way back from the conquest in the east. Villagers in this area built a shrine to commemorate his military exploits and enshrined the founder goddess of the Imperial Family. 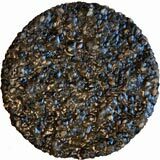 Later in the 1190s a local samurai worrier brought back a sacred stone from Ise Shrine, the main shrine of Amaterasu. The shrine moved to the present site at the middle of the Edo Period from its traditional location in the north and came to be managed by the neighboring Sesonin Temple. In the south of Sinmeigu we can see a thick forest with a number of huge keyaki trees. They belong to a big landowner family Aizawa. 40 or 50 big trees were burnt down during WWII by the American air raids. However, the residual part of the forest surrounding the house of the landowner is impressive enough. 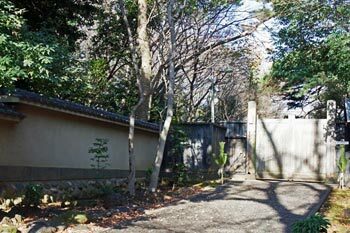 Entrance to the residence of Aizawa family. It is hard to believe that such a place exists only a few steps away from the bustle of a shopping area. Sesonin was separated into two parts due to the construction of Nakasugi Street. We see an example of brutality of modern city planning. After crossing Nakasugi Street, I turned right and walked through Matsuyama-dori shopping street. 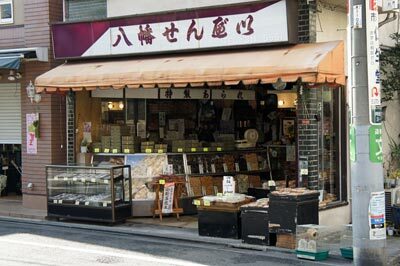 Going down a gentle slope of Matsuyama-dori, I found an old "senbei" (rice cracker) shop called "Hachiman Senbei". It made me happy to find a shop in traditional style, as it reminded me of my childhood days. Next to the senbei shop there is a culvert, trace of Momozono-gawa river. In the 1960s during the course of the miraculous economic growth, Japan lost its natural river environments. In case of Zenpukuji-gawa, the natural river banks were covered by concrete. Such smaller rivers as Momozono-gawa became first dirty drainage of waste water from household. Then they were covered by concrete plates and disappeared from our sight. It is not possible to reverse the process. During the course of industrialization since 1870s, Japan lost lots of its nature. But, the process did not advance at the same speed. We lost most of our natural and historical landscape since the 1960s, I believe and regret. A culvert next to the senbei shop. 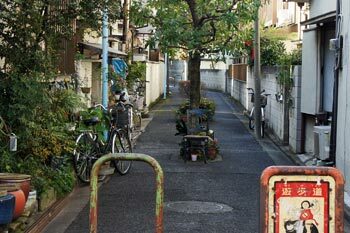 Many tiny rivers of Tokyo have been covered by concrete plates. I walkd further north and Matsuyama-dori merged into Nakasugi-dori, but soon after the crossroads with Waseda-dori, Nakasugi-dori became narrower. At a juncture of five roads five stone statues stood. They are from left to right Sho-kannon (1919), Jizo (1753), two Koshin-toh (1712 and 1746) and Bato-kannon (1766). When people suffered from epidemics in the Meiji Period (1868-1912), those old statues effectively protected people from the fatal disease. Later in the 1950s the present house was built to accomodate them and the Buddha statues have been taken care of carefully by neighbors. Five stone statue. From left to right: Sho-kannon (Avalokitesvar), Jizo-bosatsu (Ksitigarbha), Koshin-toh (Shomen-kongoh with wise monkeys), Koshin-toh and Bato-kannon (Hayagriva). We can see that not only flowers but also thousand paper cranes are offered. After a few minutes' walk from five Buddha statues, I saw another small temple which houses a Jizo statue. 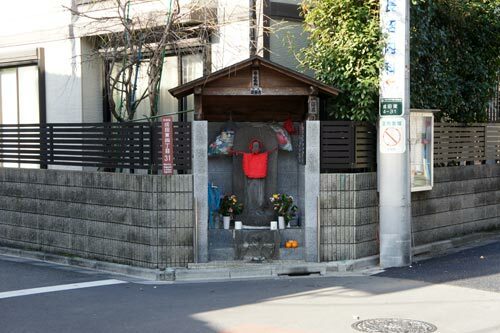 This Jizo was built in 1937 on the initiative of the head priest of the nearby Fukuzoin Temple with the donation of 1,400 residents in the neighborhood, in order to pray for the repose of the victims of traffic accidents. Unfortunately, traffic safety has been aggravating since then and many other Jizo have been erected all over Japan. This Jizo was the first in Japan for the sake of road traffic safety. 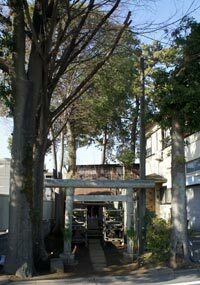 In addition to anti-traffic accident Jizo, some old statues found here their refuge when Myoshoji-gawa was repaired – its banks were covered by concrete - against flood till 1972. Seals behind Jizo statue are called "senja-satsu". Since the Edo Pediod Japanese people have a habito to stick a seal with own name on the wall or beam of sacred places as an evidence of their pilgrimage. My final destination was Saginomiya Hachimangu. This shrine was, like Oomiya Hachimangu, established by Minamoto-no-Yoriyoshi in 1064 (**) after his victorious expedition to the east part of Japan, in order to express his thanks to the god for warriors "Hachiman". (**) I am not sure whether the establishment of Saginomiya Hachimangu can be attributed to Minamoto-no-Yoriyoshi, if it was established in 1064. Minamoto-no-Yoriyoshi was relieved from Mutsu-no-Kami (Governor for Mutsu - present Tohoku region) and appointed as Iyo-no-Kami (Governor for Iyo - present Ehime Prefecture) in 1063. Having seen three large shrines along this Kamakura-kaido, I think it natural to assume that a road similar to the "Kamakura-kaido" must have existed already before the establishments of those shrines, i.e. already in the Heian Period (794-1185). Without a convenient road, Minamoto-no-yoriyoshi would not have been able to march to the north. Unfortunately there are few written documents or other documents for those earlier times. Recently more Japanese people are interested in the history and tradition of our immediate neighborhood. I find this a positive trend though this might be a result of the shrink and aging of the Japanese population, because we have started to ponder more on our tradition and culture.